(CN) – As politicians wrangle over the underlying causes, an unprecedented fire season in California worsened over the weekend with one blaze in Northern California doubling in size to become the second largest in state history. The Mendocino Complex Fire, two wildfires that merged over the weekend into a megablaze just north of Clear Lake in Northern California, doubled in size over the weekend to nearly 270,000 acres. The fire showed no signs of abating, with containment at 30 percent and weather forecasts pointing to at least several days of triple-digit heat ahead. So far, no one has been injured in the blaze though 75 homes have been lost. 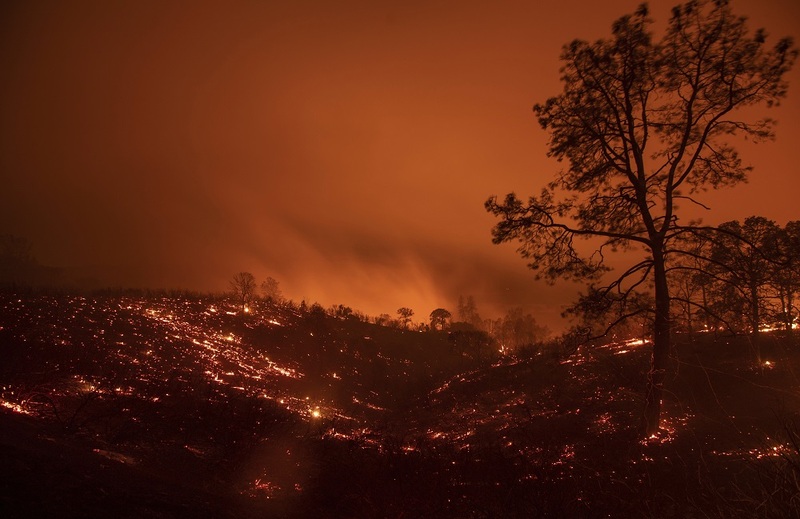 Nearly 20 fires are raging across California as of Monday afternoon. North of the Mendocino Complex, the Carr Fire claimed the life of a Pacific Gas & Electric lineman trying to restore power to the neighborhoods affected by the large blaze which continues to burn out of control. Jairus Ayeta, 21, a lineman apprentice from Uganda, was killed on Saturday. President Donald Trump approved a federal disaster declaration for Shasta County over the weekend, making it easier for residents to apply for federal assistance after the fire is subdued and the rebuilding process commences. Trump took to Twitter to give his opinion on the evolution of California’s 2018 fire season, already one of worst in recorded history with seven deaths, 400,000 acres charred and 1,100 homes and other structures destroyed. “California wildfires are being magnified and made so much worse by the bad environmental laws which aren’t allowing massive amount of readily available water to be properly utilized,” Trump tweeted on Sunday. Experts on California land use and wildfires took a dim view of the president’s command of the facts. The sentiment was echoed by Cal Fire spokesman Scott McLean, who said there was no factual basis for Trump’s assertion that firefighters are struggling to access water. Experts believe Trump is likely confusing the complaints of Central Valley farmers who blame environmental policies aimed at protecting fish they say prevent them from accessing the water they need for their parched farms. Department of Interior Secretary Ryan Zinke waded into the fight on Monday morning, acknowledging that fires are burning hotter and for longer in California. But he said environmentalists who file lawsuits that prevent the U.S. Forest Service from thinning trees are responsible for the blazes. “We must be able to actively manage our forests and not face frivolous litigation when we try to remove these fuels,” he said. Experts agree that altering current forest management practices could help reduce the intensity of wildland fires, but there is little consensus that water policy in California has any relation to the present fire season’s woes.